Jonas and Lovato surprised the crowd when they welcomed Andra Day onto the stage for a special collaboration of "Rise Up"
Demi Lovato, right, and Nick Jonas appear onstage during a Honda-sponsored news conference, on March 22, 2016, in New York. The two performers gave employees at Orlando's Pulse nightclub a surprise VIP concert experience. 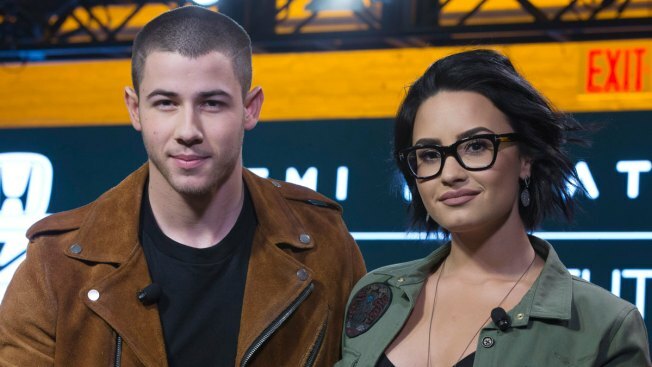 For Nick Jonas and Demi Lovato, Saturday night's concert wasn't like the rest. The two performers decided to do something special for dozens of employees at Pulse Nightclub in Orlando as part of their cross-country Honda Civic Tour. In a Facebook post shared over the weekend, fans learned that several workers were able to enjoy the duo's show for free. In fact, they even got to take part in a meet-and-greet before the show. "Nick Jonas &Demi Lovato, thank you for making the pulse family smile #onepulse #orlandostrong #pulseorlando," the post read. "We will rise and not be defeated! #onepulse #pulseorlando." According to TMZ, close to 30 employees also received a private suite at the Amway Center for Saturday night's show. During the emotional gig, Jonas and Lovato surprised the crowd when they welcomed Andra Day onto the stage for a special collaboration of "Rise Up." As the three artists showed off their vocals, the names and ages of the victims from the recent Orlando shooting were shown on the big screen. "The Voice" contestant Christina Grimmie was also honored during the sold-out concert. "Orlando you were incredible last night." Jonas shared after the show. "Thank you @andradaymusic for helping DEMI and I are honor the victims of the terrible acts of violence recently. #riseup #hondacivicfuturenowtour"
Lovato added, "I adore you Miami. Thank you. #loveislove #hondacivictour @futurenowtour."